Fall Semester and New Experiences. It’s going to be a busy semester ahead for me. I’m teaching a course at Ryerson University, Medicine from Antiquity to the 1500s, TAing at University of Toronto for a course on the history of evolutionary biology, logging hours at the Writing Center at my department, and somehow finding time to continue writing my dissertation. I came short of meeting my dissertation goals for the summer, which was to finish a complete working draft for editing–I have only one chapter left, which in my world, is pretty great. This also means I’ll keep on blogging, but limiting myself to 1-2 posts a week. The last chapter left addresses the experiences of the deaf during the late eighteenth/early nineteenth centuries in England, so of course, I’ve been thinking a lot these days about experiences of the deaf (and new experiences in general). This is one of two chapters of my dissertation that doesn’t heavily rely on a medical perspective, so I’ve had to adjust slightly how I think about using my historical sources. The few historians who discussed the experiences of the deaf in early modern England have focused largely on the attempts to teach sign language to the deaf as a means of communication. These works, however, emphasize on continental European and place a bias upon the wealthy deaf (who were able to afford private instructors) and ignore the majority of the deaf population. Emily Cockayne in “Experiences of the Deaf in Early Modern England” (History Journal, vol.46 (2003), 493-510), argues that deafness was not a uniform experience in the sixteenth and seventeenth centuries; “deafness” itself was an umbrella term that encompassed a wide spectrum of conditions—from temporal hearing loss to prelingual deafness to congenital deafness –and she alludes the disadvantages of the deaf to their socio-economic factors (i.e. traditional social divisions of wealth) rather than to their degrees of hearing loss. The majority of the deaf population consisted of the temporarily deaf, the post-lingually deaf, and the pre-lingually deaf, who have been underrepresented in historical scholarship. Additionally, the lives of people who were deaf were not necessarily miserable; deafness, especially if it was late-onset and not profound, would not have hindered the execution of many job tasks. Many deaf individuals worked, married, and coped with their conditions, though many prelingually deaf were dependent on their family or the community for their subsistence, whereas the wealthy deaf were more likely to have benefited from specialist education. In short, how a deaf person was treated and how their lives were completely depended on their personal circumstances, with a crucial variable being the ability of their immediate family to provide financial, practical, and emotional support. This is an important argument, for the revitalization of the deaf was believed to have begun from the wide-spread availability of education for the deaf, limiting crucial social, political, and cultural influences. That’s exactly why I like Anne Quartararo’s book, Deaf Identity and Social Images in Nineteenth Century France (Washington, D.C.: Gallaudet University Press, 2008). 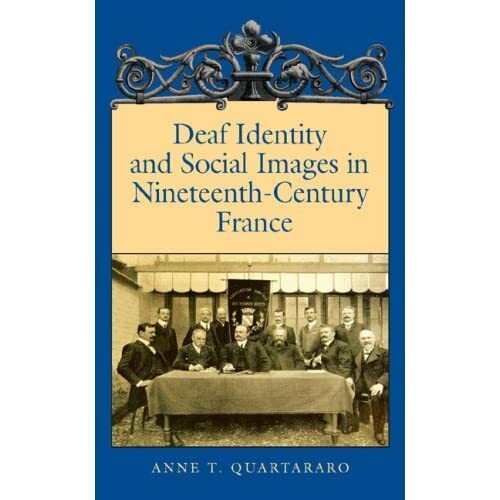 In this meticulously researched book, Quartararo captures the history of the struggles of the deaf in nineteenth century France and their attempts to establish their identity as a minority culture. By analyzing how deaf people developed strategies to defend their pantrimonine, which has been historically connected to the preservation of French Sign Language, Quartararo narrates how the roles of instructors at schools for the deaf and social reformers constructed and upheld certain social images of deafness. She makes it explicit that early 18th century images of the deaf as “deficient” had less to do with the physiological image of deafness (e.g. ear defect), and more to do with the social limitations that hampered communication between the deaf and hearing framework. Within this structure, she evaluates how pedagogical opposition to the Abbé de l’Epée’s promotion of deaf education through sign language were on the one hand, driven by Itard’s connection between oralism and a cure for deafness, and on the other hand, driven by the revolutionaries’ need to establish a national cultural identity and language. Even after Epée’s death and the State founding of the Paris Deaf Institute in 1791 (which were modeled upon Epée’s philosophy of education), the overbearing ideological boundaries of post-revolutionary Paris constructed the social and economic opportunities that were available for deaf children; within this context, Quartararo argues that the contentious period of deaf education—that was embedded in a pedagogical battle between sign language versus speech—paralleled the political unrest of 19th century France. For example, Auguste Bébain (who was Epée’s godson), opposed what he called “the poverty of instruction,” arguing that speech and lipreading actually hindered the progress of deaf children at the Institute; despite the outcries of his students, Bébain was eventually expelled as instructor for his opposition to oralism. The strong cultural images of the deaf, which associated deafness with philanthropy and the destitute hospice, were in part, guided by the missions of the Paris Deaf Institute—insisting their mission was to prepare children as apprentices for various trades, the administrators undermined the abilities of their pupils. The final chapter overlooks how, following the Congress of Milan in 1880 which promoted articulated speech as the standard for teaching the deaf, various defenders of the deaf movement (e.g. the “Deaf Banquets Movement”) struggled to establish a unified deaf identity and preserve their language. I admit, I would have really liked to see Quartararo compare the French developments with that in Britain or Germany. Her brief discussion of the medical images of the deaf people was particularly interesting and I can see this being translated to my own work on British aural surgery. She remarks how Itard, the surgeon/instructor who joined the Paris Deaf Institute in 1800 was the principal creator of the medical image of deafness. Itard began a search for a cure for deafness following his failure with Victor, the “wild boy” of Aveyron, and in doing so, he aimed to objectify the “disease” and relegate anyone opposed to modern treatments as someone standing in the way of social progress (p.20). It’s interesting to note that physiological defect, which became a key aspect of 19th century images of the deaf, were tied with the idea of progress—if progress changed (or evolved), then it is just as likely medical expectations did so as well. There was no mention of how Itard’s clinical gaze influenced other members of the medical community, or how influential it was in other nations. Well, these are just some of the things on my mind these days. I ordered six new books from Amazon, which means I’ll have some new material for Chapter One, and something to look forward to during my commute to campus.